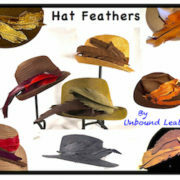 Let me choose a special Sky Series Ceremonial Feather for you ! 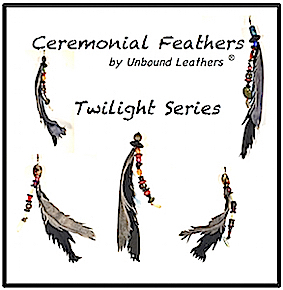 Ceremonial Feathers from Unbound Leathers® are special personal totems fashioned to bond with sacred memories, specific intentions or aspirations. To empower your totem hold it in your hands for a few minutes while moving your thoughts into a place of peaceful serenity. As you hold and gaze upon it appreciating its elements and textures, send forth waves of your intention evoking the power of attraction. The energetic essence of your thoughts will be captured and held within its form & brought forth when you gaze upon it. Sky Series Ceremonial Feathers are inspired by the magnificent sunrise and sunsets viewed from the artist’s Colorado mountain studio. 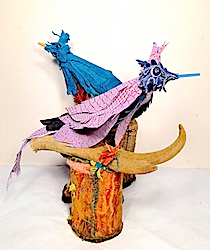 They are one-of-a-kind creations and will vary in size, complexity, color, types of leather used, style and combination of beadwork from the one pictured. 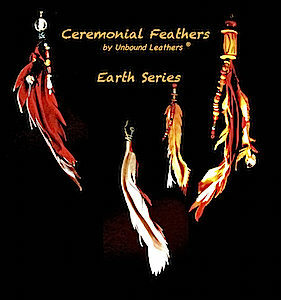 A special Ceremonial Feather using leather in this tonal range and approximately 3″ wide and 8″-10″ long, with a unique bead combination will be created by the artist to fill your order. Feather Clusters crafted to capture & carry the spirit of that special occasion, a sacred memory, a cherished moment. Ceremonial Feathers from Unbound Leathers® are personal totems fashioned to bond with sacred memories, specific intentions or aspirations. The energetic essence of your thoughts will be captured and held within its form & brought forth when you gaze upo n it. Your Feather can hang as an ornament on a tree, swing gently in a doorway, window or be attached to a long thread to float from a ceiling and spin in the breeze. Sky Series Ceremonial Feathers are inspired by the magnificent sunrise and sunsets viewed from the artist’s Colorado Mountain studio. 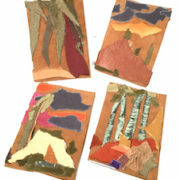 These are one-of-a-kind creations and will vary in size, complexity, color, types of leather used, style and combination of beadwork from the one pictured. 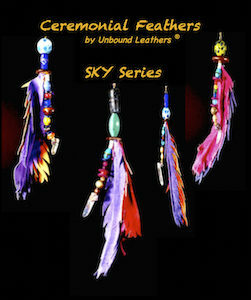 A Sky Series – Ceremonial Feather using leathers in this tonal range with a unique bead combination will be created by the artist to fill your order.